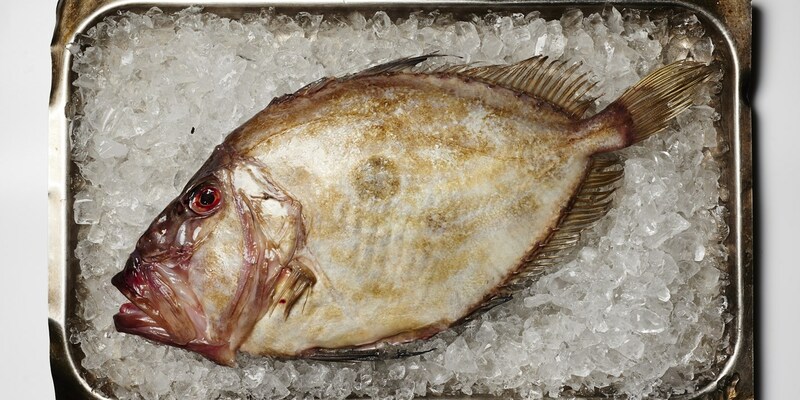 John Dory is a salt water fish, known for its white, meaty flesh which is delicate and sweet. The meat might be delicious, but John Dory isn't the prettiest, or the most economical of fish. It has spines running down its side, and is easily-distinguished by its very large head. A small John Dory might weigh 300g, but they can grow up to 2kg. Even then, the John Dory's head accounts for almost half its weight - so it's often best to buy fillets, rather than the whole fish. If you do end up with a whole John Dory, then the head does at least make a delicious stock. John Dory's curious name originates from the French ‘jaune doré’, meaning golden yellow - which describes the fish's shimmering skin. It's often nicknamed St Peter's fish though: the John Dory has a big dark spot on its side - thought to be a thumbprint from the saint himself. John Dory is available in most good high street, or online fishmongers - but rarely in supermarkets. It isn't a fish targeted by fishermen, and is usually caught as a bycatch. As John Dory is farily unregulated fish, there is little information on its sustainability. Avoid John Dory during their breeding season from June to August - for ethical purposes, and because the taste and texture of John Dory is not at its best during its breeding season. John Dory is a versatile fish - it can be pan-fried, grilled, baked whole, steamed, poached or roasted. As with all fish, it's important not to overcook John Dory. Also, it's often wise to keep the skin on to protect the delicate flesh during cooking. The only real difficulty cooking John Dory lies in the filleting. It is an unusual fish - although technically a round fish, its bone structure is more akin to a flat fish. The unusually large head and spiky sides can also throw an under-confident filleter. If in any doubt, then ask your fishmonger to fillet for you. John Dory is a versatile fish. It works well with big spices, as chef Shaun Hill demonstrates in his recipe for John Dory with potato rasam. John Dory is also happy when partnered with other flavours of the sea - like clams or mussels. The firm fish works well in a seafood stew. But often all that is needed with pan-fried fillets is a drizzle of butter, or squeeze of lemon juice.